Automatically enqueuing syndicated BitTorrent feeds is the easiest way to ensure that the latest content is available to you ASAP. Instead of getting home from work or school, searching out the latest torrents that you want (they might not even be out yet) and then waiting all night for them to download, you can arrive home to find everything right there on your hard drive. You can make your computer start the download unattended. No searching, no waiting! Although you don't have to lift a finger once you're all set up, getting everything configured in the first place is a bit complicated. This guide will walk you through the process in an easy-to-follow tutorial with lots of pictures! 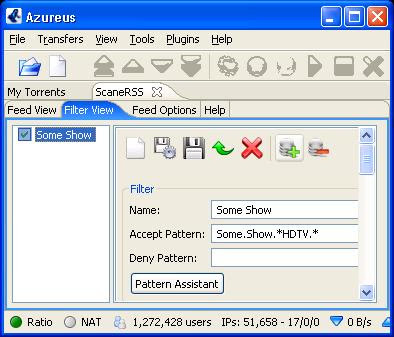 There are already plenty of tutorials on installing Azureus out there on the web, so we'll skip straight to the juicy part. 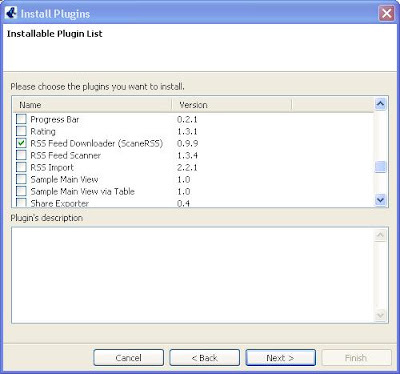 Start-up Azureus and go to the "Plugins" menu, and select "Installation Wizard". 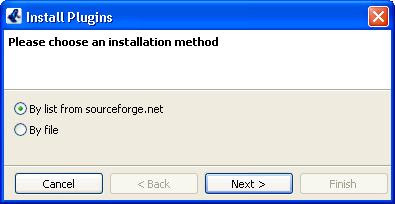 Select "By List from sourceforge.net" and click on "Next". The "Installable Plugin List" window should now appear. 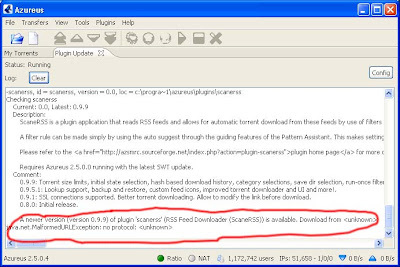 Scroll down until you see "RSS Feed Downloader (ScaneRSS)", tick that box and click "Next". Now the "Please choose installation type" window pops up. 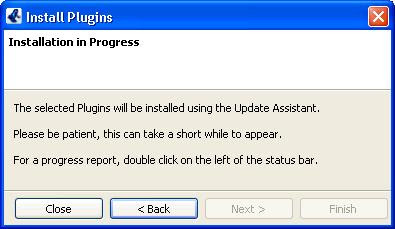 Unless you know what you're doing, just go with the default "Install the plugin(s) for all users" and click "Finish". At this point, you should see an "Installation in Progress" window. It's ok to close this window. 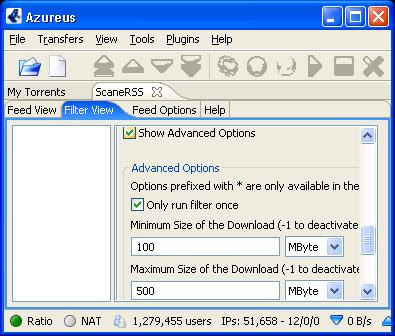 In a few moments, Azureus should have the ScaneRSS plugin available. I say should because when I tried it, the plugin never downloaded. I looked into it, and apparently the ScaneRSS people screwed up the URL that points to their plugin. Told you it was a bit complicated, didn't I? Hopefully the ScaneRSS guys have fixed their plugin URL in the Azureus wizard by now, but if not, don't fret, we can install it manually. If everything has gone smoothly so far, just skip this manual installation part of the howto. 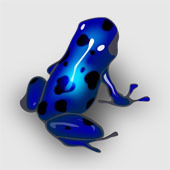 Go ahead and start Azureus again. You should now see the "ScaneRSS" item inside of the "Plugins" menu. Click on it to start ScaneRSS. Wooohooo! Now we need to tell it which RSS feeds to watch, and how to select the content we want from those feeds. Click on the "Feed Options" tab and enter a name for a new feed, and the URL of this new feed. As you can see, I have chosen a feed from tvrss.net to start off with. 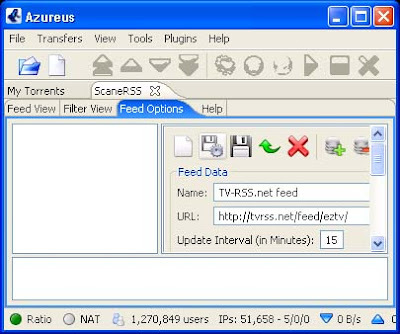 Their feeds are good for starters because they adhere well to RSS standards, and they don't let viruses or malware slip into their feeds. Unfortunately, there are a lot of television episodes listed there, so be careful to avoid any shows that aren't in the public domain so you don't run afoul of copyright laws in your country. You've been warned! Once you have the information filled in on the right, click the pciture of a disk with a gear next to it to create your new watched feed. Your feed should appear in the left panel with a checked box next to it. Now select the "Feed View" tab and then click on the + sign next to the feed to see all of the individual eps. That should work in about 99% of the cases. You can test out your pattern to see if it's matching what you want - and only what you want. Click on "Pattern Assistant" and then the "Test Rule" button. The programs that pop up in the "Matched Names" panel are the ones that would have been downloaded if you had left the filter running over the last week. If it doesn't work for you, you're probably going to have to add a "Deny Pattern" or learn more about regular expressions. Well, since I mention the "Pattern Assistant", I should probably describe a little more about how it works since it's not entirely intuitive. Open it up, find the name of a show you're interested in, and double click the name. It inserts some information into the "Name" and "Group" fields for you on the right-most panel. You can hand-edit these fields if you like. 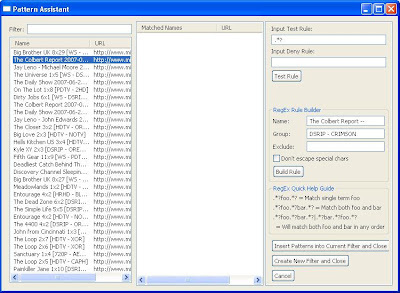 Then click "Build Rule" in order to generate the regular expression for your series of interest. Pick "Insert Patterns into Current Filter and Close" and you'll now see the pattern in the "Accept Pattern" field of the "Filter View". The problem with the rules built in this manner is that it builds in the release group and quality description into the regular expression. There are a lot of release groups out there - LOL, XOR, CAPH and NOTV are ones you'll often see tagged in the torrent name. The quality descriptor usually reads HRHD or HDTV and sometimes DSRIP if it came from a satellite feed. The point is, there is a lot of variance in the part of the torrent title that ScaneRSS calls the "Group" field, and if that exact combination of quality info and release group name isn't contained in the next episode's release, then that episode will get skipped over, defeating the whole purpose of configuring this whole Azureus + ScaneRSS bittorrent system. Eliminate the "Group" field from the wizard, and it builds a rule slightly broader than the one I suggested earlier. One extra thing I would recommend is setting is the minimum and maximum size (I guess that's 2 things...) of content that you would like to download. It will help prevent duplicate downloads of different resolutions and encodings of the same ep. The duration of the video makes a big difference in the size, but setting a minimum of 100MB and a max of 500MB should work for the standard quality encoding under most scenarios. If you want to further prevent dupes, tick the "Only run filter once" box. You'll have to reinstate the filter once a week or however often the show airs, but it's the most sure-fire way to prevent wasted bandwidth. In order to see these extra settings, check the "Show Advanced Options" box. When you're happy with your match rules and other settings, click the button that looks like a floppy disk with a gear next to it, highlight the newly created filter by clicking on the name of it in the left panel, and then click the green plus sign that looks like it's in front of a stack of pancakes. You've just applied your filter to the feed. It's live and waiting for a new torrent that matches your specifications to come through the feed. 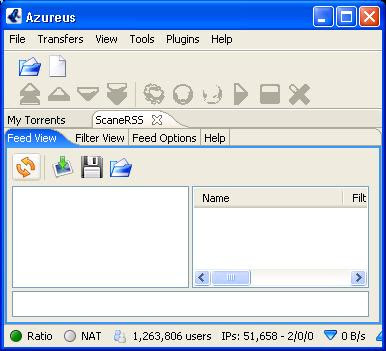 When that torrent does, Azureus pounces and starts downloading automagically. Enjoy better living through technology! For further descriptions of other features and settings of the ScaneRSS plugin, make sure to check out the oft-overlooked "Help" tab visible when ScaneRSS is open.